With the Golden State Warriors precariously close to breaking the hallowed 72-10 record of the 1995-96 Chicago Bulls, there’s been all sorts of (pointless) debate about which team would win if they ever faced off. One player who brings a unique perspective to this (again, pointless) debate is Warriors coach Steve Kerr, who was also on that ’96 Bulls team. Yet, when asked which team would emerge victorious, Kerr, as he’s prone to do, took the comedic route. And honestly, it’s the best answer of the bunch. A grammar joke! He went for a grammar joke when asked about which historic team would beat the other! You just don’t see that in sports today. 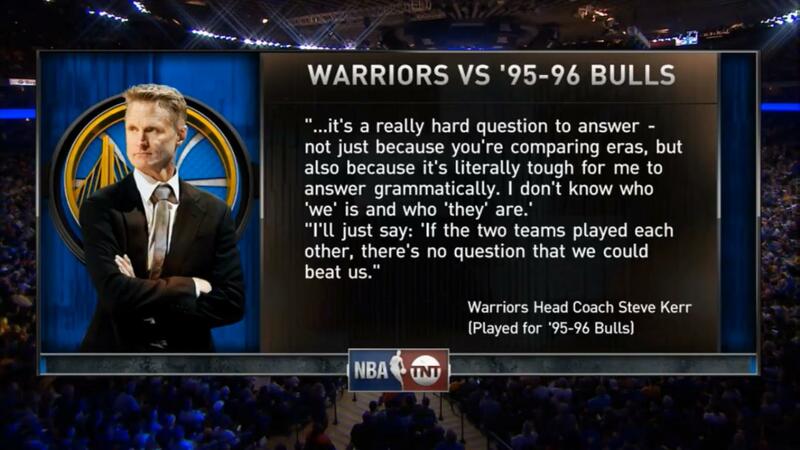 Kerr’s wit is one of his greatest strengths, something those ’96 Bulls know very well, too. In a perfect world, Kerr’s lighthearted answer would put the debate to rest. This, however, is not a perfect world, so we’re sure we’ll hear from another member of either team, and the vicious cycle will continue.